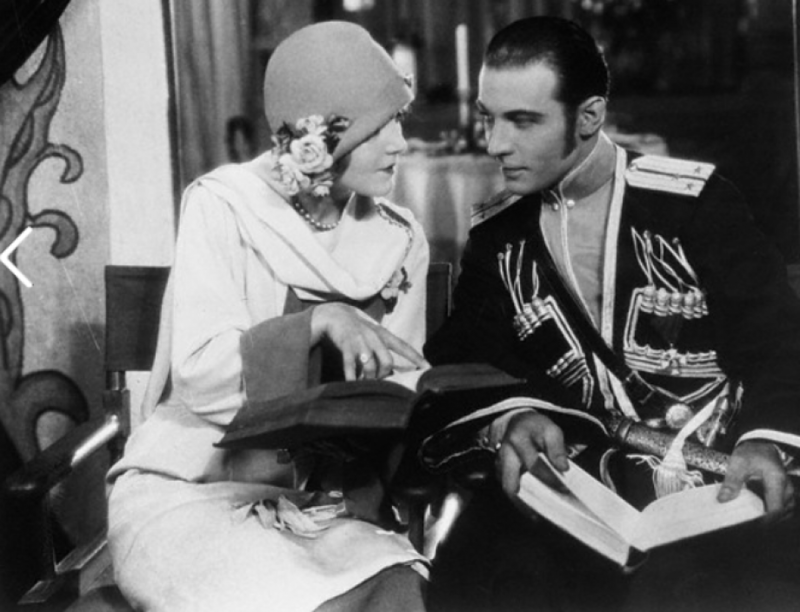 “Beauty” says Natacha Rambova, actress-designer, and one-time wife of Rudolph Valentino “is an inward quality, the outward expression of which is a vivid face and an intelligent use of colour and originality in dress”. The American people have developed their sense of beauty tremendously, especially in the last year. There is an increasing desire on the part of more and more women to express their own individuality in their clothing. “European women always dressed to please themselves, American women until recently, have dressed only to be liked everyone else. They were afraid to be different. Now they want something more than their own. They want to interpret their ideas of beauty in what they wear. Natacha Rambova is one of those American women who has found in her dress and coiffure a satisfying medium in which to express her spirit. She is a tall thin person who wears a handsome turban over braided coils of red-brown hair. A woman today she said, “does not have to classic features to be considered beautiful”. In the old days you were either beautiful or you were not. Fifty years ago, Lillian Russell was the standard of beauty. Today there are hundreds of types which are considered equally beautiful. Few stars of the screen have the classic beauty. “I wish more girls would first consider developing their personality, their inward qualities, before resorting to cosmetics and other accessories in acquiring beauty. Brilliance of expression comes from the soul and not from adroit use of powders, rouges and cream. “While cultivating the inner qualities a woman should try to find what outward things most become her spirit. She should make her dress and hair express herself. She should never to copy anyone else’s hair or costume. She should try to find out what colours are most appropriate. The old idea that brunettes should wear red and orange and blondes grey and blue is absurd. Some brunettes definitely prefer blue and should wear it. Often a frail blonde demands a vibrant red or orange because it is the reflection of her spirit. There are two types of women who can wear red attractively. The first is the active energetic person. Calmer colours aggravate her. The second is the person who inwardly seethes with activity. That person needs red to stimulate her to do things, to express her inner drive, “calm poised, placid persons should wear blues and greens”. Business and practical people invariably choose browns and beige. The proper use of colour is an accurate inflection of inward beauty. But it is impossible to prescribe colours for anyone until she has herself found out what she is. Some women, for instance come to me who have worn blue their entire lives because they were told that colour was very becoming. Their spirits were depressed by the colour so I gave them red which they secretly craved and they blossomed. Such women sometimes need encouragement. “I really believe that it is essential for a woman to get at the root of her individuality and dress accordingly, if she wants to be beautiful. Beauty based on an inward brilliance and attractive dress can go a very long way in furthering your success in life. In fact, I believe it is vital for success in life.